The trial of leader of the Indigenous People of Biafra (IPOB) suffered a major setback yesterday when a judge of the Federal High Court in Abuja, Justice John Tsoho returned his case file to the Chief Judge of the Federal High Court, Justice Ibrahim Auta for reassignment. This was after the judge washed his hands off the case on the strength of a petition against him before the National Judicial Council (NJC) by the detained Director of Radio Biafra, alleging bias. Justice Tsoho is the second judge from the bench of the Federal High Court, accused by Kanu of bias in the handling of his trial. The first was Justice Ahmed Mohammed of same division of the court. 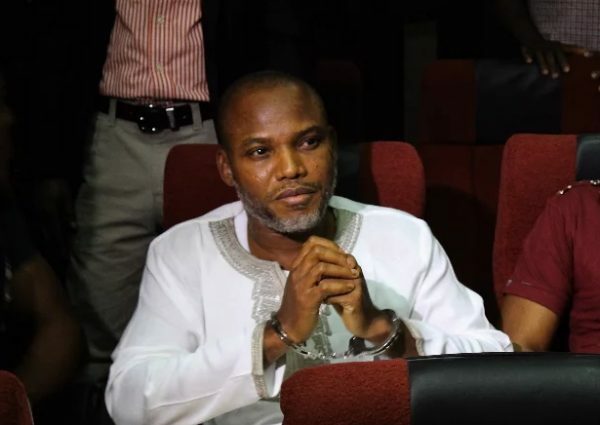 Kanu is standing trial with Benjamin Madubugwu and David Nwawuisi on a six-count charge of treasonable felony, brought against them by the Federal Government of Nigeria. When the case was called yesterday, Kanu’s lead counsel, Chuks Muoma brought an application claiming that the court had shown bias in the manner it has so far conducted the trial. He told the court that based on that premise, his client had forwarded a petition to the NJC, adding that it will only be proper for the court to suspend hearing of the case pending the outcome of investigation by the council. Muoma further informed the court that the NJC had responded to the petition filed by Kanu against the judge. “We are only asking the court to hands off the case; my client has lost confidence in this court. “Following the development, all we are asking this court to do is to hands off the case pending the outcome of the NJC investigation. “It would not be proper for the court to continue with this matter when investigation is ongoing, so, in the interest of justice, we are asking the court to hands off the case. He claimed that the court was acting in line with the suggestion of President Muhammadu Buhari that Kanu was not going to be released under any circumstance. Justice Tsoho, in a short ruling held that he had no personal interest in the trial of Kanu. The judge also condemned the attitude of the defence counsel, saying he acted un-professionally through utterances and added that he did not care if he took the case to another planet. Justice Tsoho ruled that since the defence counsel noted lack of confidence in the way the court has handled the case, “it is only reasonable for the court to disqualify itself from further hearing the matter. “Accordingly, this case is hereby forwarded to the Chief Judge for further re-assignment,” the judge ruled. He said logically, the procedure would have been for the court to wait for the response of the NJC so as not to preempt NJC’s decision. The embattled leader of IPOB, Nnamdi Kanu had petitioned the Nigerian Judicial Council (NJC) against Justice Tsoho of the Federal High Court, Abuja of “committing judicial rascality” over two rulings given against him. In the petition signed by his counsel, Ifeanyi Ejiofor, Kanu called for an investigation into the rulings of the court over the permission granted the Department of State Services (DSS) to protect its witness in his trial. Kanu also called for a correction of the “rascality” made by the judge in accordance with the Oath Act. The petition noted that the lead counsel in the matter, Muoma was shut out in an open court by Justice Tsoho from briefly outlining his written brief in support of its application for stay of proceedings even when court rules allow for 20 minutes of oral argument. The Nigerian government, through the DSS had applied to the court to seek a secret trial of Kanu among other things, where the government’s witnesses can testify and give evidence against the three defendants – Nnamdi Kanu, Benjamin Madubugwu and David Nwauwisi – by wearing a mask or hiding behind a screen/curtain. Holding Nnamdi Kanu and accusing him of treason etc. is baseless by law – an insult. The people – the natives in present territory called Nigeria are not the ones who constituted and drew the map called Nigeria, it was not done with their consent. No law can accuse a native of such a place of questioning or opposing such constitution, map and name Nigeria – it is illiteracy of the law. Only puppets of the bandits who drew the map etc. can do such a thing. Nnamdi Kanu have played his role in establishment of Republic Of Biafra, the way Odimegwu Ojukwu, Uwazuruike etc. played their role. Holding him is irrelevant to establishment of Republic Of Biafra, which the time has come and no one in this world will stand on its way. What Biafrans need to put in place now is “interim administration” with sit in the Republic’s Capital for cordial separation, social and economic developments etc. Majority of the countries in this world will recognize the Republic and the interim administration, and build relations with it, the very few countries that will probably think otherwise will not have a choice or be irrelevant. If the present administration of the territory called Nigeria think otherwise, it will not have internal and external support – meaning no capability and capacity to stand on the way of Federal Republic Of Biafra or confront it, even if it attempts, Biafrans has the capabilities and capacity of defense.